How Would You Like To Get Your Hands On Part Of The "RICHES" Of The Retail Business Industry? Do you want your very own business? One where YOU are the boss? No answering to anyone but YOURSELF!! ...I'm here to tell you that working for yourself IS a possibility. If you want to feel excitement when you go to work... if you want to feel confidence in yourself as you go about your day... if you want to feel secure in life when you close your eyes to fall asleep... ...it's time to seriously think about starting your own successful retail business! Millions the world over have made that very same decision and are now enjoying all the benefits that go a long with it. 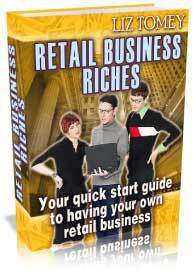 Retail Business Riches was written for YOU! Are you ready to make your own fortune with a business in retail? Anyone can start his or her own retail business! If you're searching for the freedom to be your own boss... If you're tired of being held in limbo by a fragile economy... If you've always dreamed of owning your own store, where you get to select the merchandise... ...you can take control and enter the market with your own retail business. If you read what I have to say - really think about it, and implement the steps, techniques, and strategies that I have laid out for you... ...your odds of being your own boss and leaving the rat race behind by next year will increase exponentially! Your future is in your hands. "Learn Step-By-Step, The Tasks You Need To Accomplish On Your Way To A Successful Retail Business!" "Retail Business Riches" is an info-packed ebook that will teach you all you need to know about getting started in your own retail business in the minimum amount of time. You don't have to wait for my ebook to arrive in the mail because it is ready to be downloaded to your computer right now! Inside I will give you the heads-up on what paperwork you'll need to fill out, how to choose your market, products, and location... ...along with how to set up your shop for maximum effectiveness and where to advertise. 14 questions you MUST ask yourself if you're considering starting a retail business. 6 Reasons why you should start your own retail business today. Learn the one thing that will be the most important part of starting your retail business. 1 Area of your business plan that you must know a LOT about if you are going to be successful. The 3 major types of businesses you'll have to choose from when starting up in retail... and which is right for you. How being conscious of your surroundings can help you pick the best business for your area. 2 questions to ask yourself when deciding what market to enter. What you need to be aware of if you decide to open a franchise. Why it is important to know your market before opening up your own retail outlet. 3 ways to test the demand of your market before setting up shop (and possibly wasting a lot of money). 7 areas of owning a retail business that you must know, learn, or hire someone to know something about if you want success! What you need to know about your competition to survive in the same market. 5 ways to "compete" with your competition by NOT competing with them. Learn the important and necessary details of registering your business. How to deal with taxes and the forms you'll need to fill out each year. 7 steps to creating an impressive marketing plan. Understand where to place your items in your store for maximum sales. 7 reasons why most new retail businesses fail - and how to avoid them. Learn how to use advertising properly - and how to thrive during a bad economy - with 5 relatively cheap ways to get your business name out. Learn the importance of good bookkeeping on the success of your business. "Who Else Wants To Learn The Nitty Gritty Of Becoming Your Own Boss With A Retail Business?!" "Retail Business Riches" is 30+ pages of information that will teach you all you need to know about how to get started in the industry. Even if you've never heard of the terms "Sole Proprietorship" or "Supply And Demand," (two terms you'll need to know! ), this ebook will be more then enough to catch you up to speed and send you sailing towards your own successful retail business. You may never have taken a business class, but this won't stop you from learning what you'll need to include in your business plan to make sure you're successful. Getting a degree in business is great if you want to work for someone else. But if you're going to work for yourself, who do you need to show that degree too? In 30+ pages I give you a quick rundown on what you could have learned for $50,000 in college tuition fees. I'll catch you up and send you on your way. For a lot less then that. If you want to be your own boss... escape the rat race... be in control of your own future... I can show you for the price of one very cheap "textbook." For just $17, you can start telling your friends about your exciting new venture. To start your new life, just click the order now button below! Sincere Best Wishes For Your Success!